In a shallow dish, combine the cornmeal, paprika, brown sugar, oregano, cumin, garlic powder, one teaspoon salt & fresh ground pepper to taste. In a bowl, combine the mayonnaise, sour cream, shredded cabbage, cilantro, zest & juice of one lime, half a teaspoon salt and fresh ground pepper to taste. Mix well and set aside while cooking the fish. Heat 1-2 tablespoons oil in a large skillet over medium-high heat. Dip the fish fillets in the seasoned cornmeal mixture on both sides and cook in heated oil 3-4 minutes on each side until nicely browned and crispy. The inside of the fish should be a pale white when fully cooked. Set cooked fish on a cutting board and slice with a sharp knife. To assemble: Layer tortilla, chipotle ranch sauce, salsa, fish, mayo-cilantro coleslaw, shredded cheese. Top with additional salsa, cilantro and a squeeze of lime. 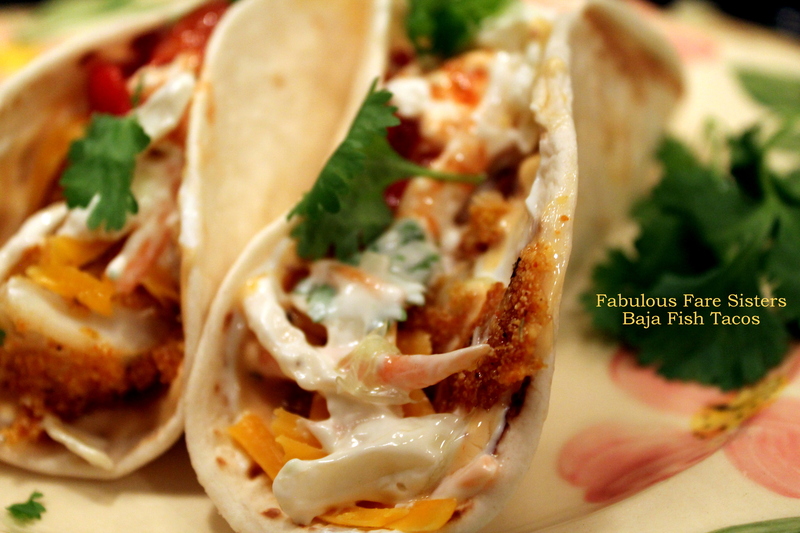 Take a big bite of these delicious Baja Fish Tacos…Enjoy! I love the Chipotle Ranch / Fish Taco Combo! A great match! Had these for Tuesday dinner here tonight in Sydney, Australia and we absolutely loved them, thanks so much Linda! I’ve been using cornmeal to coat fish for shallow, light frying and/grilling more recently and find it gives the fish a nice crispy coating that is lighter than breadcrumbs. 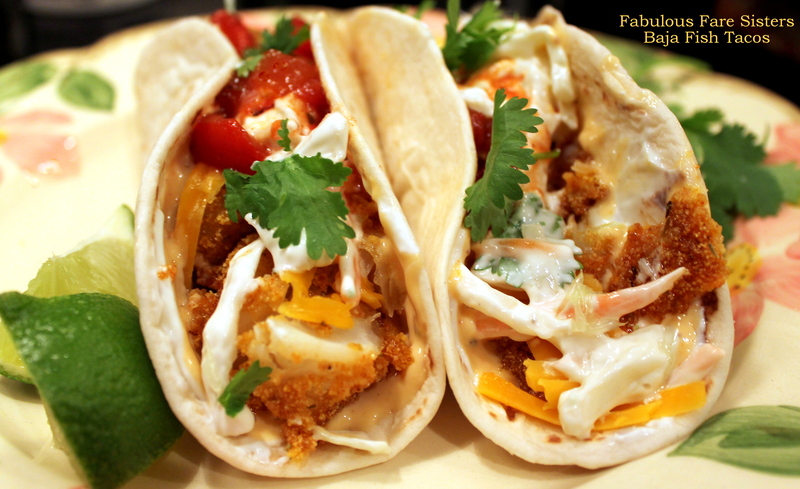 This fish taco recipe from http://www.fabulousfaresisters.com (thank you) uses the same technique and makes for a quick, tasty and easy weekday dinner. We use flathead fillets here’s in Australai, skip the cheese and ranch sauce, but add Old El Paso jalapeños. On the menu for dinner this week! This is brilliant Linda, I really like what you did here especially with the spices you used! Oh my, now I’m REALLY hungry, Linda! The appetite starts with the eyes & you’ve nailed it! That might work! I’ll post when I’ve tried your recipe and let you how it goes. I suspect the recipe is better than our taqueria though! I’ve never had fish tacos, but think I would definitely be a fan based on this. I mean what is not to like. NOTHING better than some good fish tacos. Great job! Though I am not a fan of fish in tacos, I know several that really like them. Your Fish and Chips,now, are right up my alley.